This new animation is even more slow than in Snow Leopard - nearly 1 second to switch - a real productivity killer. Secondly there's a reference in the binary to fps-spaceswitch (frames per second spaceswitch). I messed with this for a while and also tried variations on this such as spaceswitch-animation-duration without luck. Unfortunately (at least as of 10.7.1) there does not appear to be a way to change any settings related to this animation. I filled a bug for this with Apple. The Radar number is 10073864. I would encourage you to also file the report at https://bugreport.apple.com/. Note in your description that it is a duplicate of the above bug report number to help the support staff categorize and prioritize this bug. I've just noticed that doing ctrl+[number] is noticeably faster than ctrl+→/← . It's still animated but it does complete the animation in about half the time. I'm not sure if that helps but I'll throw that out there. TotalSpaces is still in beta and a bit glitchy though. There's a small delay before changing spaces, and the whole screen seems to move a few pixels horizontally during the transition. Edit: both of those have now been fixed. I noticed that it is possible to control the speed of the space-change animation when you use the Swipe gesture in OS X Lion. You can make the spaces change as fast, if not faster, than they did in Snow Leopard by doing a quick three-finger or four-finger swipe to the left or the right. Of course, it's definitely something to get accostomed to if you've always used ⌘+→/←. This did get me thinking. Since it seems that changing spaces via arrow keys, number keys, and gestures all perform the same type of animation, there is likely a single system command that all three of these actions map to. Additionally, since they all perform the animation at a different speed, there must be a parameter that controls the animation speed. I'm not an OS X developer, so hopefully someone else with a better knowledge of the underlying functionality of OS X would be able to determine what system commands are actually running when the user performs a certain action. Not the answer you're looking for? Browse other questions tagged macos lion spaces . 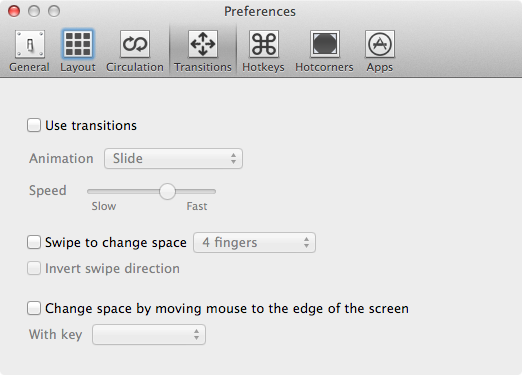 How to turn off slide transition when switching between two full screen applications on OS X Mavericks? Mission Control slow and jerky on 2011 MacBook Pros: any fix? Is there an Apple list of terminal based tweaks? Prevent Xcode windows from exiting fullscreen after wake from sleep? Lion: Switching Spaces with Key Controls darn slow? How to disable TimeMachine animation? 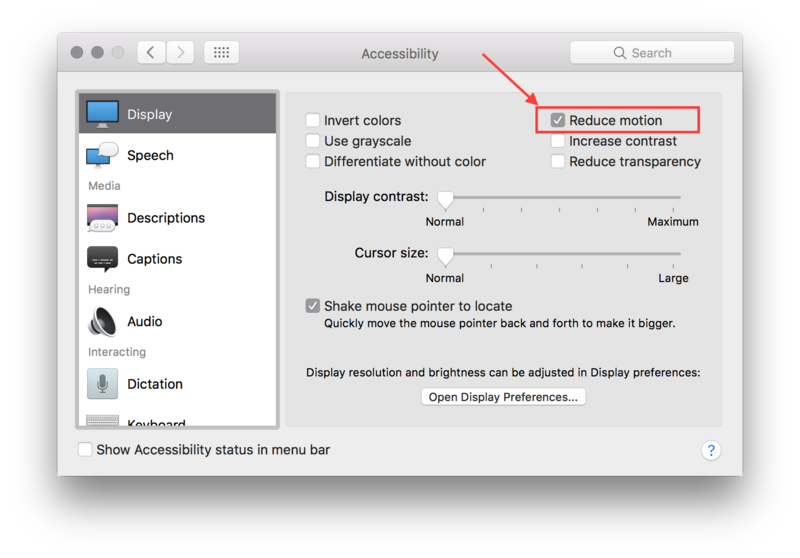 How can I disable animation when switching desktops in El Capitan? Can I choose or influence the two kinds of transition animation while switching between desktops?